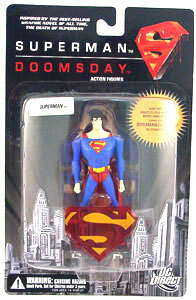 Description Of Item: Superman: Doomsday is an original animated movie based on the best-selling DC Comics storyline of all time?The Death of Superman! These figures are based on art from the animated feature due out Fall 2007 from Warner Home Video. The Death of Superman was a multimedia event covering the front page of newspapers worldwide, gaining prominent radio and TV coverage and attracting millions of readers.